Give Your Mom The VIP Treatment She Deserves This Mothers' Day! The annual arrival of Mothers' Day always makes us take a reflective pause for a moment--why haven't we been celebrating our Moms all year-long?! They're our shoulder to cry on in our rational (and irrational) fits of despair, our sideline cheerleader for every adventure (and misadventure) and has the liberty to tell us when our ensemble is not so flattering without us getting offended. Okay, maybe we'll get offended for approximately 90 seconds but we're grateful for that honesty! At the end of the day, our mothers are nothing short of being absolutely amazeballs! 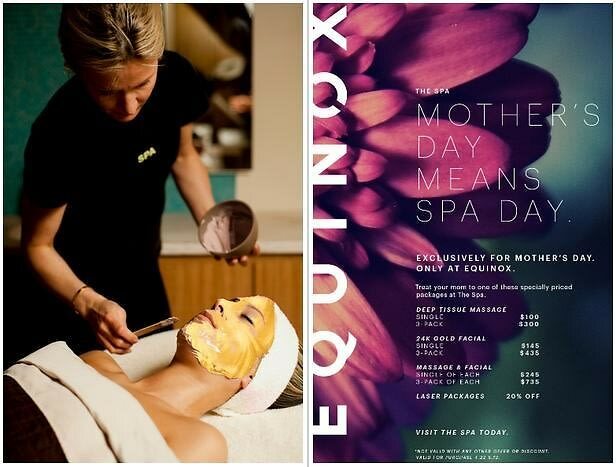 Naturally, we want to spoil them on this holiday and we can think of no better way to do so than with Equinox's 24k Gold Facial that exudes the luxury that they deserve.Luckily for our banks, Equinox is running specialty prices between now and June 12th for their Gold Facial and Deep Tissue Massage. (What's that, Dad? You're in the market for a deep-tissue massage for Father's Day??) We're huge promoters of the art multitasking so why not kill two birds with one stone with these momentarily discounted rates! And, the discounts extend to their 3-packs of treatments so you can keep your parents pampered throughout the entire year! And trust us, after our adolescent years, they deserve need some QT at the spa!